Explore your potential by joining the team of winning professionals. Executive Director Strategy (1) & operations (1), Head office, Karachi. Core Responsibilities: The Executive Director Strategy/Operations in partnership with the Council (Board) is responsible for the success of the Institute through accomplishment of vision and mission; ensure deliverables relevance to the community; and effectively disseminating short and long term strategies. The incumbent(s) shall be seen as a visionary, innovative and committed professional. Coordination with Council and Standing/Non-Standing Committees for compliance of decisions undertaken and Liaison with Government Departments, Public Sector Organizations, Foreign Missions etc; Managing Legal Affairs and infrastructure related projects; Executive Director Operations. Establishing synergy in the Head Office and nationwide centers/campuses to ensure quick and amicable solutions to operational issues. Making Institute financially viable and take measures to ensure sound financial management Managing human resources and to keep them motivated, accountable, trained and developed to meet expectations. Qualification: FCMA or equivalent or PhD (in Accounting, Business Admin., Economics, Law, or Computer Science, etc. with 13 years of relevant Post Qualification Experience; OR ACMA or Master Degree or equivalent. With 18 Years of relevant Post Qualification Experience. 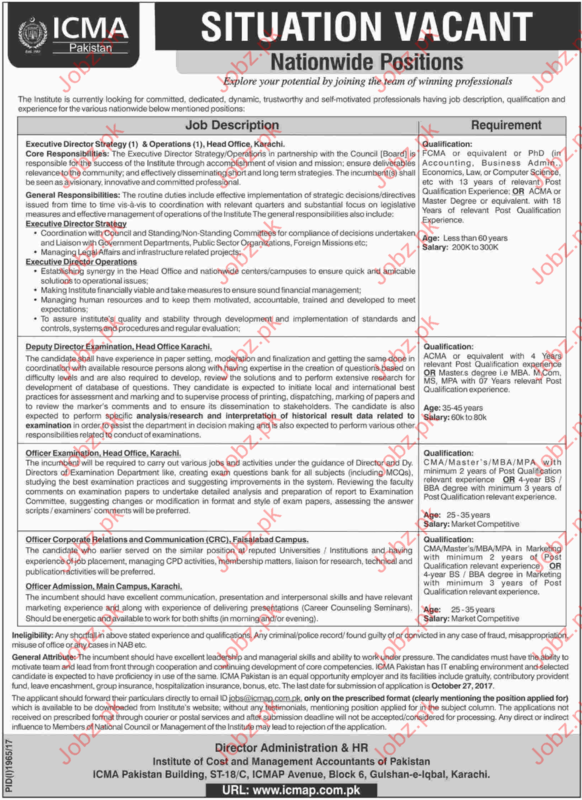 Deputy Director Examination, Head Office Karachi. The candidate shall have experience in paper setting, moderation and finalization and getting the same done in coordination with available resource persons along with having expertise in the creation of questions based on difficulty levels and are also required to develop, review the solutions and to perform extensive research for development of database of questions. They candidate is expected to initiate local and international best practices for assessment and marking and to supervise process of printing, dispatching, marking of papers and to review the marker's comments and to ensure its dissemination to stakeholders. Qualification: ACMA or equivalent with 4 Years relevant Post Qualification experience OR Masters degree i.e. MBA.M.Com, MS, MPA with 07 Years relevant Post Qualification experience. Officer Examination, Head Office, Karachi. 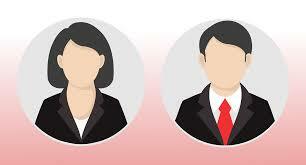 The incumbent will be required to carry out various jobs and activities under the guidance of Director and Dy. Directors of Examination Department like, creating exam questions bank for all subjects (including MCQs), studying the best examination practices and suggesting improvements in the system. Qualification: CMA/Master's MBA/MPA with minimum 2 years of Post Qualification relevant experience OR 4-year BS 1 BBA degree with minimum 3 years of Post Qualification relevant experience. Officer Corporate Relations and Communication (CRC). Faisalabad Campus. The candidate who earlier served on the similar position at reputed Universities Institutions and having experience of job placement, managing CPD activities, membership matters, liaison for research, technical and publication activities will be preferred. Officer Admission, Main Campus, Karachi. The incumbent should have excellent communication, presentation and interpersonal skills and have relevant marketing experience and along with experience of delivering presentations (Career Counseling Seminars). Should be energetic and available to work for both shifts (in morning and/or evening). Qualification: CMA/Master's/MBA/MPA in Marketing with minimum 2 years of Post Qualification relevant experience OR 4-year BS 1 BBA degree in Marketing with minimum 3 years of Post Qualification relevant experience. Ineligibility: Any shortfall in above stated experience and qualifications. Any criminal police record/found guilty of or convicted in any case of fraud, misappropriation, misuse of office or any cases in NAB etc. ICMA Pakistan has IT enabling environment selected candidate is expected to have proficiency in use of the same. ICMA Pakistan is an equal opportunity employer and its facilities include gratuity, contributory provident fund, leave encashment, group insurance, hospitalization insurance, bonus, etc. The last date for submission of application is October 27, 2017. 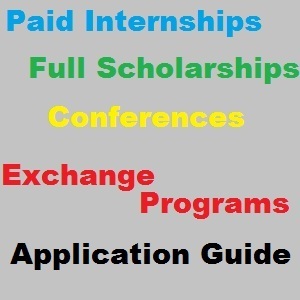 The applicant should forward their particulars directly to email ID jobsGlicmap.com.pk, only on the prescribed format (clearly mentioning the position applied for) which is available to be downloaded from Institute's website; without any testimonials, mentioning position applied for in the subject column. The applications not received on prescribed format through courier or postal services and after submission deadline will not be accepted/considered for processing. Any director indirect influence to Members of National Councilor Management of the Institute may lead to rejection of the application. You can apply online at vacancy after registering at http://www.jobz.pk site.